The lighter horizontal layers are shell pavement layers. Every single one of these layers in the quarry is dominated by shells of the Brachiopod Striispirifer niagarensis. Most of the Striispirifer in these layers consist of single shells. Scattered among thee shells are intact Striispirifer often in living position, (hinge down) displaying vertical compression. The intact Striispirifer occur mostly as random clusters numbering in the hundreds of individuals. Once recognized, these layers were easily traceable across the entire width and length of the quarry. 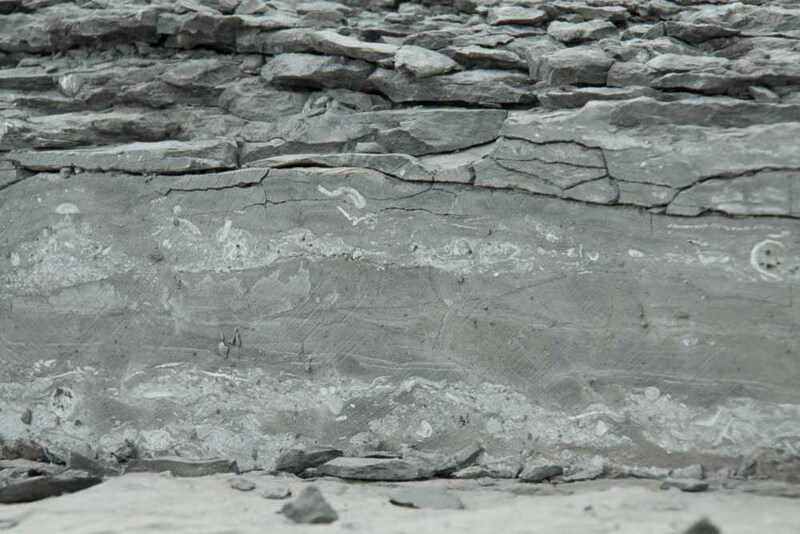 Between the shell pavement layers are mostly barren mudstone layers ranging in thickness from 2.5 cm to 7.6 cm. It is in these mudstone layers that perfectly preserved intact complete fossils of trilobites, brittle stars, starfish, crinoids and cystoids are found.